I love dill pickles! I'm not even picky either- give me the big, cheap jarred ones or the crispy kosher ones. My favorites, though, are the ones you always seem to find by chance at a roadside vegetable stand, or in a country store - the homemade ones. I never knew making pickles was so easy until I found Katie's instructions, via the beautiful photo she posted at Healthy Yum. A quick scan of the list told me that I had everything on hand except fresh dill and mustard seeds. I picked them up at the grocery store and spiced up my hum drum afternoon with some pickle making! 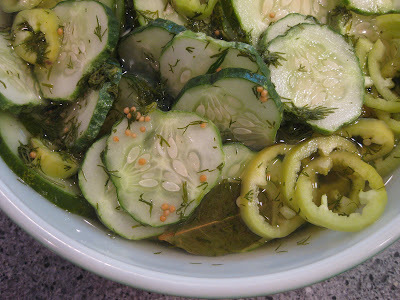 Combine cucumbers, pepper slices, garlic, and bay leaves in a bowl. Combine vinegar, water, sugar, dill, mustard seed, and salt in a small saucepan and bring to a simmer. Stir until the sugar dissolves, and then pour this over the cucumbers. Cover the bowl, let cool, and refrigerate. The cukes and peppers are great the next day, but they develop a more intense flavor if left longer. Using Johnny's mom's cucumbers and peppers, I used 3 medium-ish cukes (they were short but fat) and two banana peppers. Other than that, I stayed right on track with the recipe. I let the pickles chill for about 12 hours in the plastic wrap covered bowl. But, my fridge started to smell like vinegar and it was taking up a lot of room. So, I moved the pickles to two small jars and a small plastic container for easier storage. Check out Ordinary Recipes Made Gourmet for this week's BSI: Peanut Butter! Entries due by Sunday, August 23rd!Biz's reminder of the rules if you'd like to jump into the contest can be found here. I'm going to submit some photos from this post to Hey What's for Dinner, Mom? 's weekly BFF (Best Foodie Foto) contest. Think you can beat me?! Enter your own favorite photos all week, voting is after she's rounded up the entries on Sunday. i've actually had a lot of trouble with various pickle recipes over the years, but maybe i'll try this. Homemade pickles are definitely the best! We used to make refrigerator pickles in the summer, and we used to make regular pickles too. I remember how hot it always got in the kitchen with the big canning water bath on the stove. Ugh! Ooh, I never thought about adding banana peppers! Damn, you beat me to it! I actually bought my stuff, just haven't gotten around to it yet - yours look great by the way! hhaha Biz I made them a few days ago - my posts are still a little behind from the NC trip updates. I've already eaten one of the jars and about 1/3rd of the storage container. They have such a unique taste, and are so crisp that they become addicting. I think "ok one more" and then next thing I know I've eaten 5. I want to sample these pickles!